This is a space for publication of previously unpublished research which has at least some connection with Treacleware and related wares. Submissions are invited from anybody who has something to contribute in this area. Already published material may also be considered for inclusion here where relevant. This is a free service, no royalties will be paid but authors will retain full copyright over their material and all authorship will be fully acknowledged. Banded ware and mochaware wasters. In 1988 a large deposit of late C19th ceramic kiln waste was discovered during construction works opposite the site of the Bristol Pottery, Water Lane. 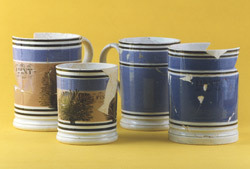 This included mocha ware, lustre ware, transfer printed ware, treacleware, black basalt, printed redware, spongware, green glazed ware and ‘Jackfield’ type ware. This article will be made available soon!